Now, the question is will I make any money from this job? May be I’ll but there is also a big fat chance that I won’t. I haven’t made any money till now, not taking into consideration the few cents I made from ads! On a more positive note, after months of creating my profile on a popular freelancer website, I finally received my first order. I guess that’s a good news! Coming back to blogging which is my main focus, is it really possible to make a fair income and a decent living from blogging? The Internet is full of stories and living legends who make quite a lot of money through blogging. Making money through blogging is possible and many people do blog as a full time profession. But the success rate in blogging today is much lower than a few years ago. Blogging is highly competitive, with the increase in number of new blogs being created everyday. Building a blog, maintaining its quality and its very existence takes both your energy and resource. Learning about blogging alone is a very challenging task, and learning to monetize your blog takes this challenge to a whole different level. Jobless: yes! Hopeless: not yet! I can say I’m halfway through the first part of that challenge. I’m still learning new things about blogging and about the world of content creation everyday. The more I learn, I find there is only way more to learn. About making money from blogging, I don’t think that I will make a lot of money or probably any money anytime soon. But I don’t care. I love doing this job and I’ll keep doing it as long as I can. Worst case scenario: my last drop of savings will run out and then I’ll be forced to let ‘the job‘ take a back seat and let a ‘real world job‘ sit on the front seat. But today is not that day, so we won’t think about that. Our community of friends and followers in the blog is about to cross the 3K mark. Friends who were once strangers but not anymore! I would like to think similar thoughts and relatable experiences are the bridges which have narrowed the gap between us. I’m full of gratitude to all of you who have liked, commented, followed or even for once read any of my blog posts. You have supported me in my endeavour of spreading my new found positivity. So, whether I make any money from blogging or not, your support, empathy and love is more than enough to encourage the bejeezus out of me! At least for this year! 💬 If you have any suggestions for me or ideas about blog post topics (things you would like me to write about) or any questions for me to answer, please do share it in the comments. Wishing you the very best in your new career. Go get them!!! I love your pursuit for self identity. It is refreshing and something to ponder on. FOLLOWING DREAMS IS AN EXPENSIVE SPORT, thats what I feel…. Thanks for sharing the thought. I have to agree with you on this. I am finding everything expensive, especially now that I have lower purchasing power. At least I don’t need money to buy dreams, may be that’s why I’ve got plenty of that! Kudos to you and your perspective! Loved it!! I always say as long as you’re doing it from your heart the rewards are endless. I admire your courage to stop the job looking conundrum! I hope it will work out for you or that the perfect job will fall out of the sky. I wish you the best as you follow a new road to fulfill your dreams. The best advice I’ve heard about writing was to write about things you feel passionate about. Whatever that may mean for you. Perhaps you feel passionate about the plight of the jobless or maybe you love fashion or art. It isn’t necessarily the topic that matters as much as it is that you feel it in your soul. Your passion for the topic will show in your writing. People will be able to feel with you. That is very true and a great advice. Thank you so much Chris for sharing. I have always felt I write better (actually much better) when I write from heart and about something I feel passionate about. Readers also connect more with those posts. I’ll try to keep applying this advice, truly the best advice about writing. It’s always good to follow a dream…you will have no regrets in life…making money is not the issue….money can be made anyways if one sets his mind solely on that…what matters is satisfaction..and I am sure satisfied you will be that you are giving your passion your heart and mind…yes there will struggles…results not commensurate to effort ..then that’s what life is all about…no one who has sincerely put in the efffort fails..yes chances if partial and not achieving the desired success are always there….Do your bit and be happy.. This is very refreshing…you don’t often see a perspective like this. Thank you! I found it was good to take a break when I was unemployed. It recharges the batteries. It isn’t the job but the work ethic that counts. The trouble with writers is they don’t have a work ethic, which is why so many fail. (I count myself in that noble company!) Maybe one blogger in ten thousand makes a living from their blog, the rest just enjoy writing it. I should hate to do do it for a LIVING! A week or so’s freedom from the endless round of CVs can only be good – more power to you! Your mindset is amazing and worth emulating and to think that HOPE is the fuel that keeps the vehicle of life moving. I wish you nothing but success. ‘Your calling is in what you often think about’ – so simple, so true. Thank you, EUI. Hi! i’m in the same situation, I have a media production degree but couldn’t find a job related to my education. It’s really really competitive, around 3 years i worked in logistic, but now…I wanna carry on developing my creativity and became a freelance illustrator. You blog is very very helpful, I will keep reading it and getting motivation and power to carry on in this very hard journey. I guess I have to deal with sooooo muuuch rejection, but I hope I will make it. Thank you, you are amazing ! Thank you so much Natalie for such a wonderful feedback. To find cool & amazing people (just like you) through my blog, has made blogging the best thing ever! Nothing can be more comforting in struggling times than to find people you can relate to. So, thank you for sharing your story with me. Our journey is the same, trying to break away from unemployment, towards self employment. I know I will be working when I’m 75 but I like the idea of living for the now, living for your own happiness. Thank you so much for sharing your thought. The idea for a wholesome life perhaps is to find your heart’s desire & follow your own path to happiness without compromising on your beliefs. Our jobs should help us to be more happy and not the other way around. Employed or jobless, it doesn’t matter. What matters is you are following your dream. Keep on going! I hope you’re able to find work soon. The US economy especially over the last 12 years has become so difficult to find steady work in. I’ve seen so many middle class people who used to have a lot of assets and good incomes become totally wiped out over the last few years. 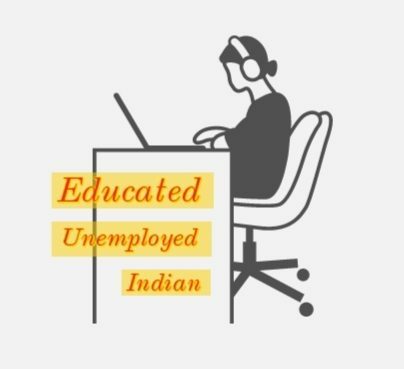 (educated unemployed indian) Thanks for the post and your authenticity of matters, which concerns me as well. I have become a professional student who is now looking for ways to advance my self help and empowerment passion.